Patriots, we are still on the road on the Rebuild America Defeat Obama bus tour. It has been over a month and Mary really misses Sammy, our greyhound and Marilyn her cat. I miss Sammy, but not the cat. 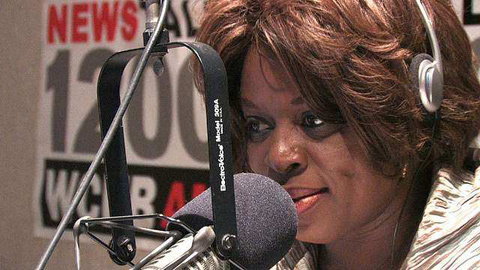 Anyway, I was interviewed on the morning drive talk radio show, Inside Detroit with Mildred Gaddis. The liberal black host and her callers were pretty PO-ed at me for being a black man chairing the Campaign To Defeat Barack Obama. They began the interview by airing our Barack Obama's Legacy of Failure ad. http://www.youtube.com/watch?v=uMbCOPNgevc The host attacked me claiming that fact checkers confirm that our ad is full of lies. Of course, I defended our ad as being dead on target and that her so-called "fact-checkers" were Obama sycophant hacks. Well, things went down hill from there. Enraged callers chimed in with "Mr Marcus, I am sooooo angry at you!" To their credit, we battled for three segments on the radio without the host or her furious callers calling me a "stupid n — ," which normally happens when I challenge the left's rhetoric. Still, the interview was quite heated and compelling. The producer wanted to keep me for a fourth segment but, I had to get ready for "bus call" to our first rally of the day in Kalamazoo, MI. While sparing with the black host and her black callers, I received a revelation; truth and facts did not matter. They were so consumed in their racial bias that Obama's black-skin trumps everything. I was blown away that they could not see the immorality of voting for Obama solely because he was black. The host called loyalty to Obama a matter of black pride. I got it. These racist people can not be changed. They simply must be defeated. The host asked where the money came from for our TV ads. Talking about tossing me a softball, I proudly informed Mildred that our funding comes from "the people," not the Republican party. Originally, we planned to tour the country. But, polling convinced us that our efforts to get Romney/Ryan elected would best be served touring Michigan, Pennsylvania, Wisconsin and Iowa. I am proud to say that the efforts of our "Rebuild America — Defeat Obama" tour team has contributed to the Romney/Ryan surge. We have made several swings through the Upper and Lower Peninsulas of Michigan, airing TV ads, radio ads, publishing newspaper ads, and doing interviews with the press. When the producer of Inside Detroit requested an interview, I knew their goal was to discredit me and portray me as a traitorous black paid-off by the Republicans. Candidly, I prayed before the interview asking God for wisdom to deliver whatever he wanted me to give listeners. Despite the host and callers ganging up on me, I am confident that somebody in Mildred's mostly black radio audience thought, "That man is right. It is racist to vote for Obama solely because he is black like me." I have peace that I was where I was supposed to be doing what God wanted me to do.